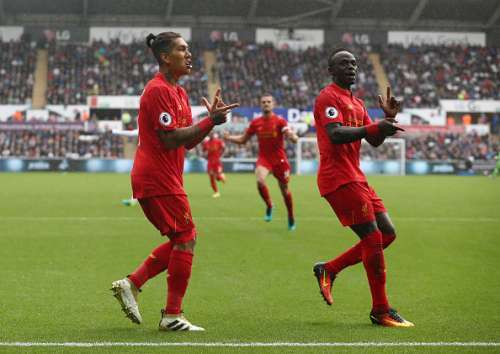 Liverpool extended their winning run to five in all competitions after beating Swansea City 2-1 at the Liberty Stadium. 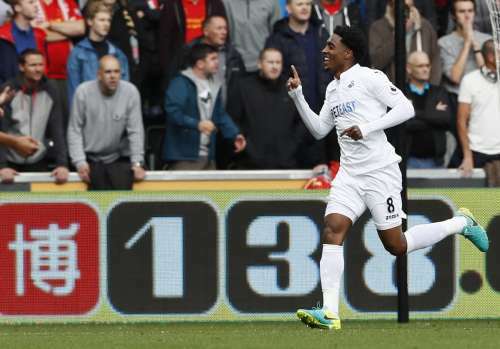 Leroy Fer scored Swansea’s opener before Liverpool sparked a comeback after the break with a header from Roberto Firmino and an ice-cool penalty from James Milner to clinch three points. The result lifts Liverpool to second place in the PL table for now, while further jeopardising the position of Swansea manager Francesco Guidolin, whose job is now hanging by a thread after a dismal start to this year’s league campaign. Let’s have a look at the player ratings of the game. The former Arsenal goalkeeper was barely tested in the first-half as Liverpool failed to hit the target. He was not at fault for the first goal and was well-protected by his defence in front of him. He could have done better with the penalty late into the game as he was beaten with ease by Milner. The Swans right-back had a good first-half and did well in the second as well, which included a surging run into Liverpool’s box to feed Routledge. However, he let himself down by giving away the penalty by committing a foul on Firmino inside the box. The Spanish centre-half put on a top display in defence and was a key reason for Liverpool not having a shot on target in the first-half. He dominated the Liverpool forwards in the first-half and picked up an assist for Swansea’s opener. Amat kept Swansea in the game with crucial interceptions in the second-half on Mane, Sturridge, and Coutinho. If not for him, Liverpool would have won by a much more considerable margin. The Dutchman worked well with Amat to shut out Liverpool in the first-half and struggled in the second-half against a raiding Liverpool attack. He should have equalised for Swansea in injury-time. The 27-year old left-back tried his best to contain Sadio Mane, but had mixed results as he was beaten by the Liverpool forward’s pace and movement on a regular basis. He, however, executed an important block on Mane in the second-half with the scores level. The Swansea captain showed why he was missed at the start of the season with a diligent display against the Liverpool midfield, especially in the first-half. He was sharp in his reading of the game as Swansea did well for their lead in the first-half. However, he started getting stretched as Liverpool increased the tempo and conceded the free-kick that led to Liverpool’s equaliser. The Englishman worked hard to support Swansea both in attack and defence and did well in the first-half to contain Liverpool’s midfield thrust. He was given the captain’s armband after Britton’s substitution and blocked a dangerous ball from Liverpool’s Can late in the second-half. The Dutchman scored his 4th goal of the season with a tap-in off a corner exposing Liverpool’s set-piece frailties yet again. He was the first line of press for the Swans as they counter-pressed Liverpool to win the midfield battle in the first-half. He became increasingly frustrated in the second-half as Liverpool came to life and was substituted to provide more stability in midfield. The Icelandic international was a constant attacking outlet for the Swans’ attack and delivered inviting balls from free-kicks and corners. His corner led to the first goal and Borja should have also scored from a fantastic free-kick delivered by Sigurdsson in the first-half. In the second-half, he failed to win the battle against Clyne and faded as the game progressed. The 31-year old wide man caused all sorts of problems to right-footed Milner at left-back with his pace and produced a brilliant cross for Borja who failed to head it home. He was replaced by Barrow in the second-half as Guidolin wanted a more direct attacking option with the game level. The club-record signing from Atletico Madrid made his first start of the season as the lone striker for the Swans and was a constant menace to the Liverpool defence. He showed excellent movement to get into position for a free header off Routledge’s cross and another header off Sigurdsson’s free-kick. However, he failed to score either of them. He was left isolated in the second-half as Swansea failed to get forward with the same verve as in the first-half. Barrow came on for Routledge in the 61st minute to provide direct running for Swansea. However, he struggled to cope with Liverpool’s pressing and was constantly dispossessed off the ball. He played a part in conceding the Liverpool penalty, but did well in one instance to skip past Lovren. Ki replaced Britton but failed to help Swansea gain a foothold in the game. Fulton came on for Leroy Fer and failed to make an impact on the game.